Yesterday was my birthday. 🙂 It was a very low-key celebration since it fell on a Tuesday and both my kids are super busy this time of year with school activities. Plus my brother has been in the hospital for a week with pneumonia which has really dampened my spirits. Fingers crossed that he will get to go home today. I did bake myself a birthday cake a few days in advance. 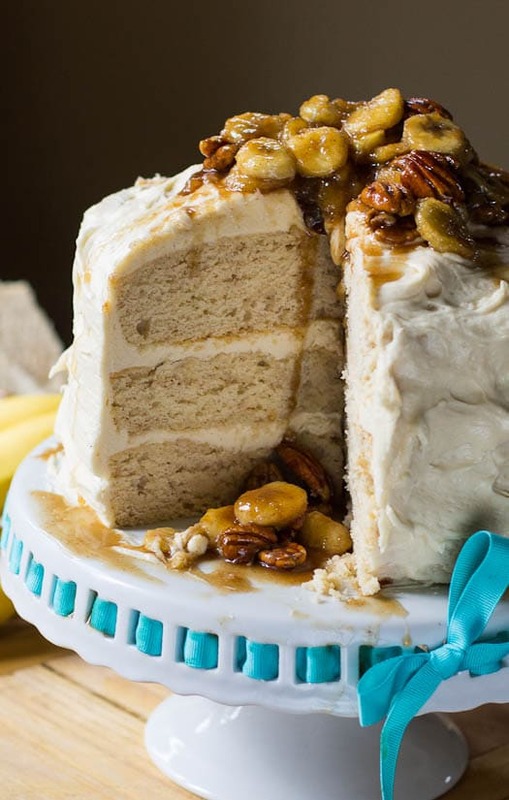 A Bananas Foster Cake that I saw in a Southern Lady magazine. I’ve been baking a lot of banana desserts lately including Banana Pudding Bars and Banana Pudding Cupcakes. Maybe because since I entered my 40s last year, I feel like I am going bananas. Bananas Foster is a delicious dessert created in the famous Brennan’s restaurant in New Orleans in the 1950s. I’ve been looking for an excuse to try this cake version. It consists of a 3-layer cinnamon flavored cake with boat loads of caramel icing and a bananas foster topping. Whether it’s a birthday or holiday celebration, this cake is sure to impress. The cake portion turned out well. It was fairly dense, but not at all dry. 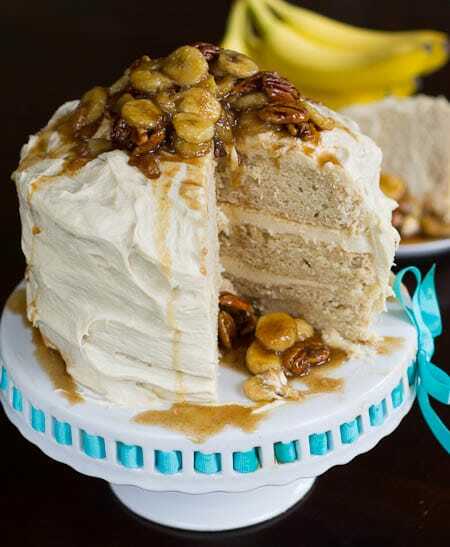 If I were to make another Bananas Foster Cake, I would probably add some mashed bananas to the cake part to carry the banana flavor throughout the dessert. The Caramel Icing made a huge amount and while it didn’t have a very strong caramel flavor, it was delicious. I should have spread more icing between the cake layers. I am the worst judge when it comes to using frosting. I’m always worried that I’m going to run out and not have enough to cover the top and sides. I shouldn’t have worried though because in this case the recipe makes what seems like 2 gallons of icing. I ended up with so much frosting on the sides and top, my cake looked a little like a ball! I added a little extra sugar to the icing because I didn’t feel like it was sweet enough. The icing was a little on the thin side in consistency and after I got half way through icing the cake, I popped it in the fridge for a little while to firm it up before I finished the frosting job. The topping was sinful, supremely sweet and boozy. The recipe calls for both dark rum and praline liqueur, but says to use just rum if you don’t have any praline liqueur. Which I didn’t. But I did have some macadamia nut liqueur which I decided to use since macadamia nuts go so well with bananas. The topping was my favorite part of the cake and I excitedly piled it high on top of the cake. Which I soon regretted. It started to drip down the edges of the cake and over the side of the cake stand. 🙁 Lots of curse words were said. I must have gone through half a roll of paper towels while I was trying to take pictures. I could not for the life of me get it to stop flowing over the edges and dripping down onto my placemat. I immediately wished I had not chosen the cake stand with the ribbon around it because now it is completely coated in bananas foster topping. This cake definitely needs to go on a cake stand with a lip around it. Oh well. Live and learn. 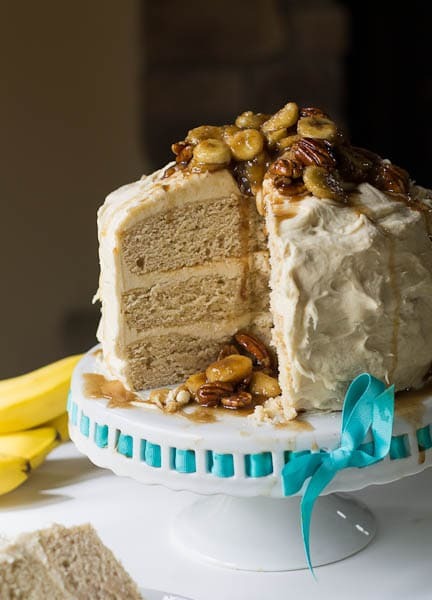 A layered cinnamon-flavored cake with Caramel Cream Cheese Icing and a Bananas Foster Topping. Preheat oven to 350 degrees and butter and flour 3 (9-inch) round cake pans. In a large bowl, combine butter and sugar and beat at medium speed with an electric mixer until fluffy. Add eggs one at a time, beating well after each addition, and stopping to scrape down sides of the bowl. Beat in vanilla. In a medium bowl, combine flour, baking powder, cinnamon, and salt. Add flour mixture to butter mixture, alternating with milk, beginning and ending with flour mixture. Pour batter into prepared pans. Bake 25 to 35 minutes or until top of the cake feels firm when gently pressed on. Let cakes cool 10 minutes. Remove from pans and place on wire racks to cool completely. For icing, combine dark brown sugar, whipping cream, and 2 tablespoons butter in a small saucepan over medium heat. Cook for 3 to 4 minutes stirring constantly to dissolve the sugar. Let cool completely. Using an electric mixer, beat remaining 1 1/2 cups butter and cream cheese at medium speed until smooth. Add brown sugar mixture and vanilla and beat to combine. Gradually add in confectioners' sugar, beating until smooth. Spread icing between layers and cover top and sides. For topping, melt butter over low heat in a medium skillet. Add brown sugar and cinnamon and cook for 3 to 4 minutes, stirring continuously. Turn heat up to medium and add rum and liqueur and salt. Cook for 5 minutes, stirring frequently. Add bananas and pecans and cook for 1 minute. Let cool before spooning over top of cake. 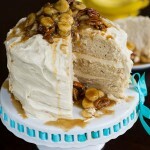 This entry was posted in Cakes, Desserts, General and tagged banana, bananas, cake. Bookmark the permalink. I want to make this cake for Thanksgiving. Of course I need to make it the day before. Is it ok to make the topping the day before as long as the cake is covered ? It looks DELICIOUS! I want to make this for Thanksgiving – Can I make the topping at home and then put it on a few hours later, when we are ready for desserts? It’s a lovely stand even if it is covered in caramel LOL, can you tell me where you bought it? I love making banana foster sauce! Only difference with mine is i use malibu banana rum and spiced rum like kraken or tattoo, and i set it on fire!!!! i love watching the pan turn blue for a few seconds. Yes to this cake! Fabulous idea wow! Happy birthday to you!! And this is the best cake I’ve seen all week!! I want! Happy, happy belated birthday, Christin! I hope your brother gets well soon, too. This cake — what a way to celebrate! I’m the same way with frosting – I use it sparingly so that I won’t run out, then I have a bunch leftover. I had to laugh about the topping running all over — that happened with my s’mores cake! I almost didn’t post it as I thought it was a hot mess. That oozing goodness is what draws people in come to find out! Pinning this cake. Good luck cleaning the cake stand. Thank You Marcie! I gave the cake stand a good bath in the sink and set it on a high shelf in the pantry. I’m afraid to take a close look at the ribbon! Happy belated birthday Christin! Hope your brother gets better soon. Love this gorgeous cake. It’s the perfect way to celebrate a birthday. Take care. Happy Birthday! 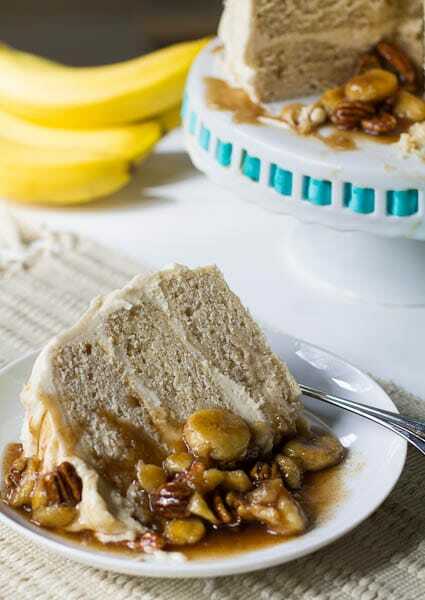 Bananas Foster was my grandparent’s favorite dessert….I would love to make this cake for my Grammy’s 80th birthday this January. Looks so moist and delicious and decadent! Thank you for sharing! Thanks for the birthday wishes! And my brother is out of the hospital. Such a relief! Oh man – this cake looks beyond awesome! Wow. And happy birthday!! Happy Birthday, Christin! I hope your brother gets well soon. 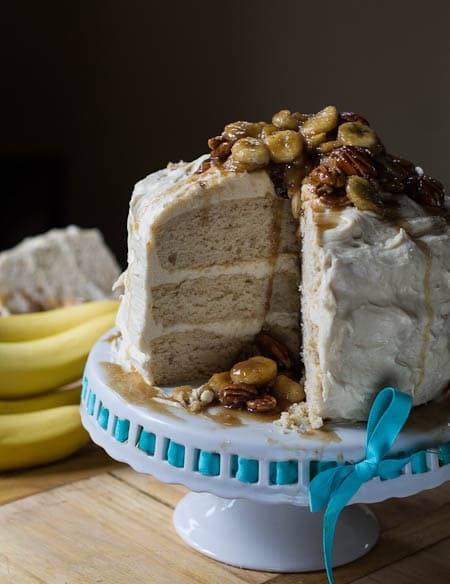 I love banana desserts and this one sounds like the perfect cake to celebrate your birthday. Happy (belated) Birthday!!! Wow, what a perfect cake to bake yourself. This looks SO GOOD! Haha, I always have issues judging how much frosting I should use too. I love when a recipe says “use 1/3 of the frosting on the layer” or something…although I usually still don’t trust it. I absolutely love bananas foster…especially just served warm with vanilla ice cream. Man, now i’m salivating. I hope your brother gets well soon! I know! I hate when it says 1/3 too. I always look back and forth between the cake and the frosting bowl and think- Ok, how much have I taken out of the bowl!